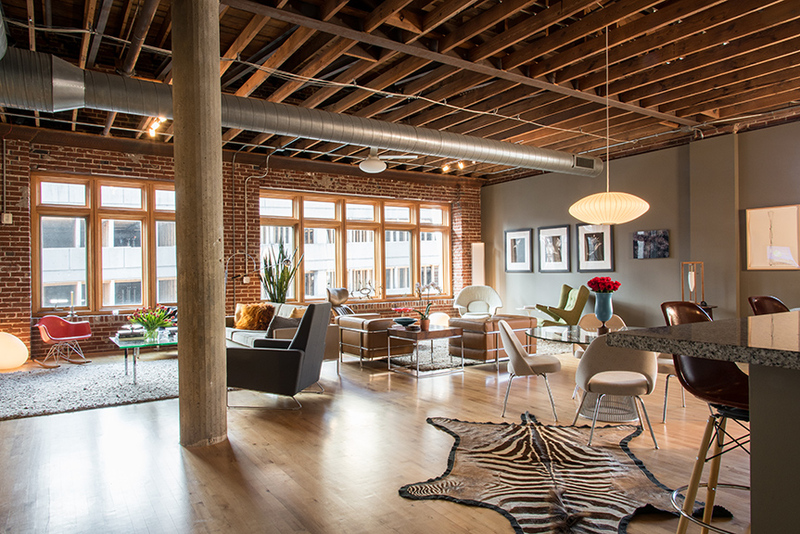 This stunning luxury loft typifies the residential renaissance taking place in The Lou. This classic Hans Wegner papa bear chair is representative of the owners' vast Mid-century collection. Contrasting textures become a unifying element in the TV area, with its brick wall, Barcelona glass cofee table, streamlined Herman Miller sofa, gleaming chrome and deep-pile rug. Converted from a walnut Russel Wright bedroom dresser, the dry bar is flanked by Philippe Stark ghost chairs and stylish sconces from TFA. Reflected in the mirror is a Geoff Story photograph the owners have self-titled "Grandma." A harmonious blend of styles, the conversation nook combines Adrian Pearsall chairs with an antique traveling chest, sculptural Tom Dixon candelabrum and a faux fur rug. 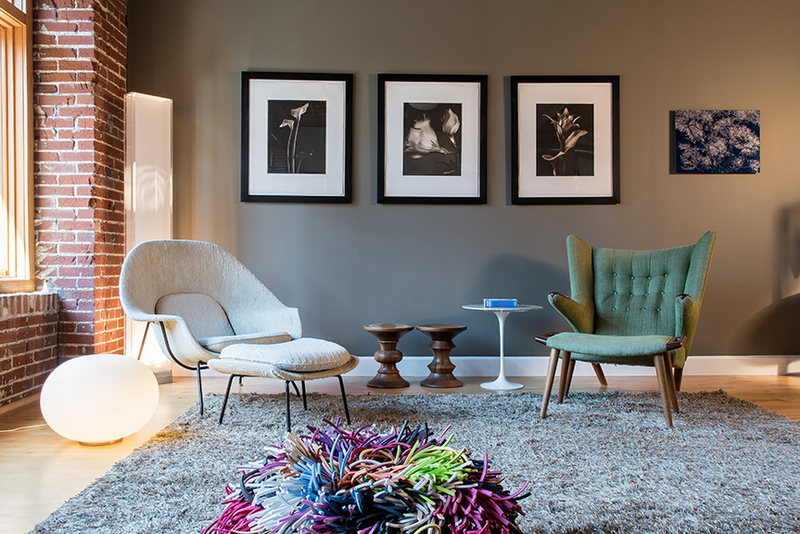 Defined by a hand-knotted Kasthall rug, the "drawing" room showcases a Saarinen womb chair, Wegner papa bear chair, Eames walnut stools by Herman Miller and a fanciful "ottoman" made of shredded flip-flops. Rhythmic and gracefully contoured, the Herman Miller dining ensemble is accented by a zebra skin rug. Artwork includes floral prints by Tom Baril and a Havel charcoal entitled, "Three sheets, two knots." The master bedroom's architectural features are complemented by wood paneling, a walnut bed and linens from West Elm, rustic chests repurposed as end tables and a landscape by Ken Worley. 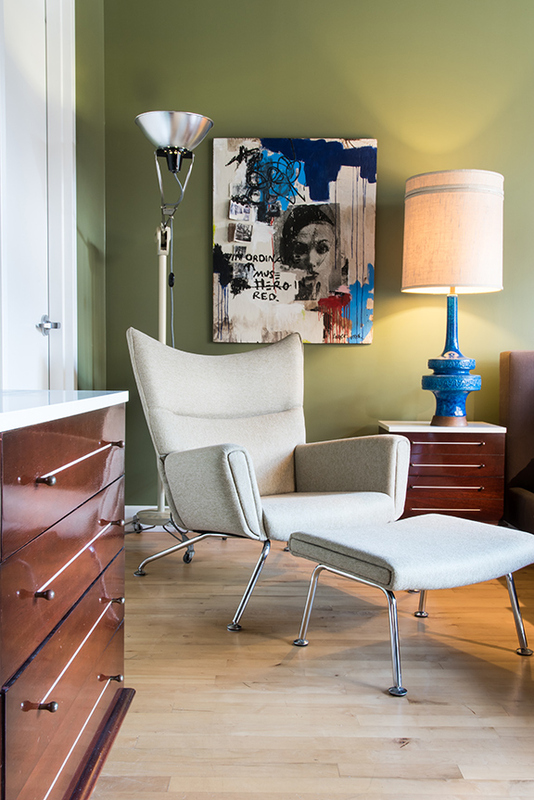 Authentic Mid-century furnishings in the guest bedroom include a Hans Wegner wing chair with ottoman and a high-gloss dresser and bedside table topped with white Formica. A metro-area native, Greg consults with local nonprofit organizations. Intrigued by the energy and attractions of urban living, he moved from West County to a rental property in the city in 2009 to “test the waters.” Soon after, he met Justin, who is the VP of operations and sales for a marketing research firm specializing in insurance and came to St. Louis from Kentucky 15 years ago. Among their many commonalities were “complementary art tastes,” including a preference for Mid-century modern design. Pleased with the city’s vibrant lifestyle, they made the decision to invest in a home in the downtown area, subject to four basic requirements. It had to be on the top floor, with personal outdoor space, private laundry facilities and indoor parking. Meeting all of their qualifications was a spacious two-bedroom loft occupying half the top floor of the historic Alexander Building. Built in 1906 and listed on the National Register in 2004, the five-story structure was renovated in 2005-07, together with the neighboring Spool Thread Building. Once a major national supplier, Spool Thread manufactured the cotton and silk thread used in the Washington Avenue garment district. 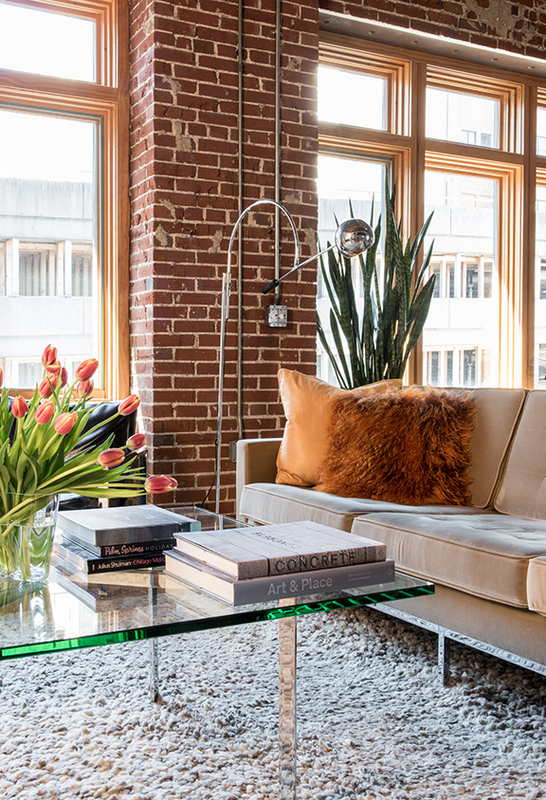 The view-packed residence is characterized by the interior features often found in St. Louis’ trendy lofts, including vast banks of windows, exposed brick walls and HVAC ducts, sturdy support pillars and ceilings that soar to 16 feet at the beams and open to the superstructure beyond. “We call it our ‘ranch in the sky,’ ” Greg quips, remarking on the convenience of single-level living. Topped with dusky-hued granite, a 13-foot, bi-level work island defines the kitchen. Dark chocolate cabinetry and stainless appliances, including a 6-foot wine cooler, are set against eggshell-toned walls, and a semi-pendant light fixture harmonizes with the pale blue backsplash. Suspended above the island, three black Moooi pendant lights add visual interest. 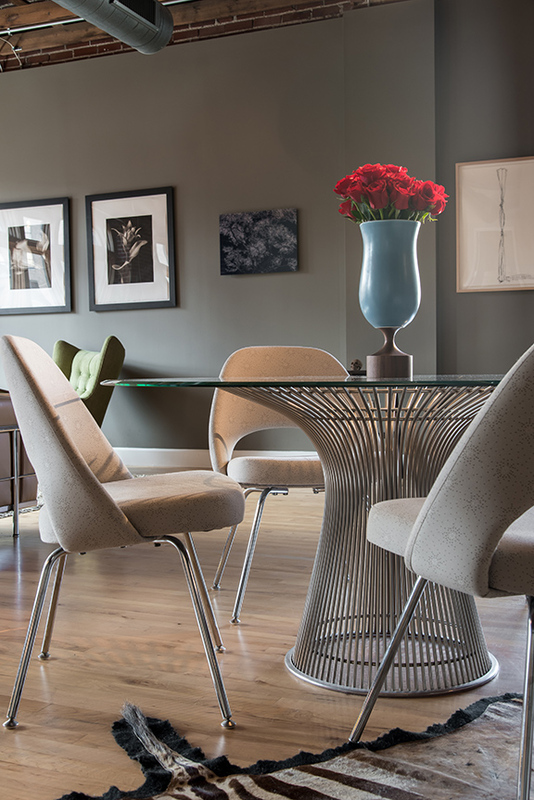 The adjacent dining area is furnished with a sleek Herman Miller ensemble – streamlined chairs and a dynamic glass-and-stainless pedestal table, accented by a zebra-skin rug from Ken Meisner. In front of the windows, a cozy conversation grouping features two gray/blue Adrian Pearsall chairs and an 18th-century traveling chest from Jules L. Pass Antiques. Atop the chest is a Tom Dixon candelabrum that illustrates the owners’ design acumen. “We’ve let the candles drip to create movement,” Greg explains. Random floor orbs provide subtle lighting for both spaces and, illustrating the owners’ sense of humor, a colorful “ottoman” made of shredded flip-flops and a red Mezzadro stool by Archille Castiglioni lend a fanciful touch. “Justin grew up on a farm, and the stool reminds him of a tractor seat,” Greg laughs. Serious again, he mentions that one of the unique aspects of their collection is that many of the chairs include ottomans, something of a rarity with Mid-century designs. 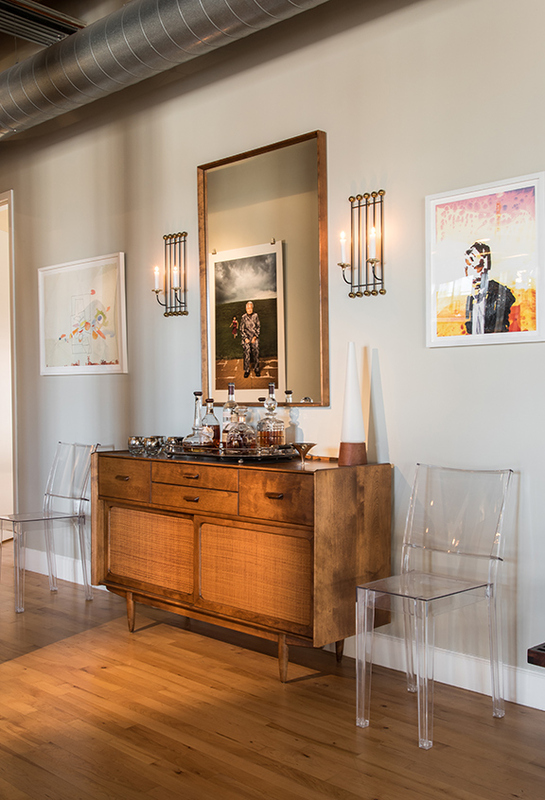 Conveniently positioned for entertaining, a walnut Russell Wright bedroom dresser has been separated from its mirror and converted to a credenza which the owners use as a dry bar, liberally stocked with Justin’s favorite Kentucky bourbon. The master bedroom’s open-beamed ceiling rises to approximately 18 feet and, reinforcing the loft’s industrial ambience, an exposed metal beam calls attention to the patio doors accessing the balcony. 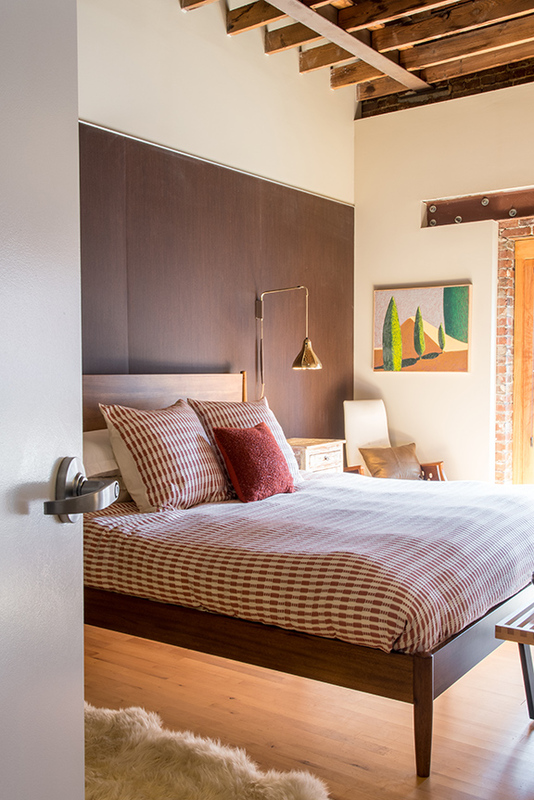 Wood panels line the wall behind the walnut bed from West Elm; rustic chests from Jules Pass have been repurposed as nightstands; and at the foot of the bed is a George Nelson bench. Throw rugs – one a woven Indian piece, the other freeform and plush – add color and texture to the gleaming wood floor. In the opposite wing, sage green walls establish a tranquil atmosphere for the guest bedroom. West End linens cover the upholstered bed, and a Hans Wegner wing chair with ottoman fills one corner. Faithful to the home’s Mid-century styling, the high-gloss dresser and side table from Rocket Century are topped with white Formica, and a classic blond Thonet chair sits under the windows. 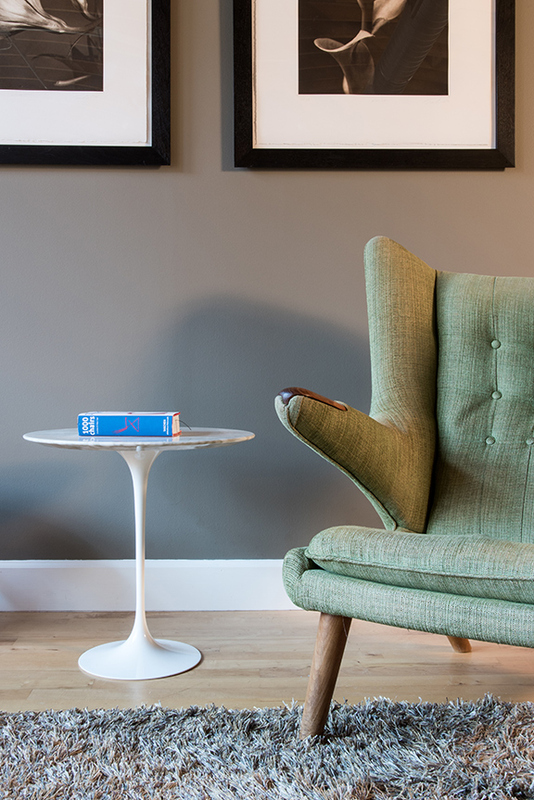 When it comes to wall art, the owners’ tastes are eclectic, but lean toward the contemporary. 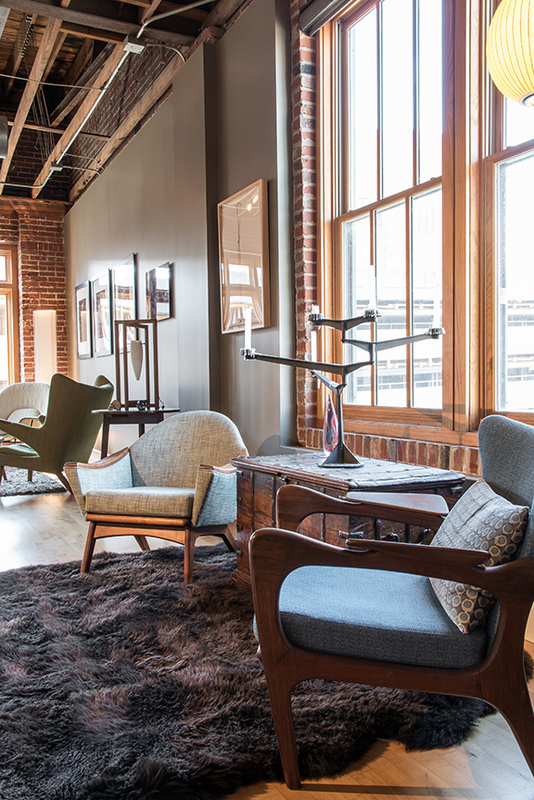 Blending nicely with the loft’s décor, many of their acquisitions have come from the Contemporary Art Museum. Delighted with their chic “ranch in the sky,” Greg and Justin have become “big proponents” of downtown living. From the St. Louis art scene to the restaurants, ballgames, Peabody Opera House and City Garden, they are thoroughly enjoying everything the Gateway City has to offer.